Melt-Banana are a noise rock duo (vocalist Yako & guitarist Agarto) hailing from Tokyo, Japan. The twosome are well known for playing extremely fast grindcore and noise music mixed with experimental, electronica and pop-based song structures. We’ve traced some rather shaky footage captured by a member of the audience from the last time Capsule put on Melt Banana… all the way back in 2008! Were you there? If so, here’s a chance to reminisce ahead of seeing them play again this May 27th at Rainbow Warehouse. Tickets here. They will be supported once again by Glatze, who also played the 2008 show… so it’s a right little reunion for all involved! Sam Underwood, the man behind Glatze had this to say: “I can’t wait to dust Glatze off for another outing alongside Melt Banana; for old times’ sake”. We also warmly welcome Thrilling Headgear to the bill. Thrilling Headgear features past/present members of Opium Lord & Stinky Wizzleteat. They take influence from Bad Brains, Melvins, Cavity, Floor, ZZ top and much more. But the “the page we’re all on is groove”, says guitarist Neil Bailey. 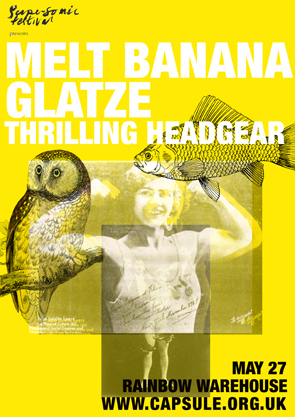 Tickets for Melt Banana + Glatze + Thrilling Headgear can be bought here.